Now I can say I personally know a real American hero. This week is the ISC West 2012 show in Las Vegas. As most of you know, HauteSpot is exhibiting. One of our good customers is Paul Babakitis of PGB Executive Investigations from New York. Just last week I spoke to Paul and he said that he was going to be coming out to Vegas for the show and that he would definitely stop by. What happened next was all over the news. Paul was on a JetBlue plane from New York to Las Vegas. During the flight the pilot flipped out and wanted to crash the plane. Paul, as a retired NYPD Sergeant leaped into action and helped subdue and restrain the pilot until the flight could safely land. 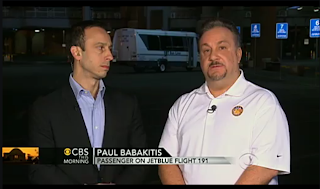 Paul helped save the lives of all of the passengers on the plane. So today, when Paul actually arrived at our booth at Las Vegas, we all cheered for him and were glad to have our friend, business associate and hero safely arrive at the show. Personally I don't know if I would be getting back on a plane right after an event like this happened. Paul, everyone at HauteSpot salutes you and your bravery. Now we all know a real hero.